Below are pictures of a Blue Wildebeest that Theo shot with his 8x57JS at a distance of approximately 250m. The rifle was zeroed at 100m and Theo aimed higher than normal. The bullet touched the underside of the spine and Theo reports that the Wildebeest fell in its tracks. He used the 160gr HV bullet, loaded with 53gr S335 at 2982fps. 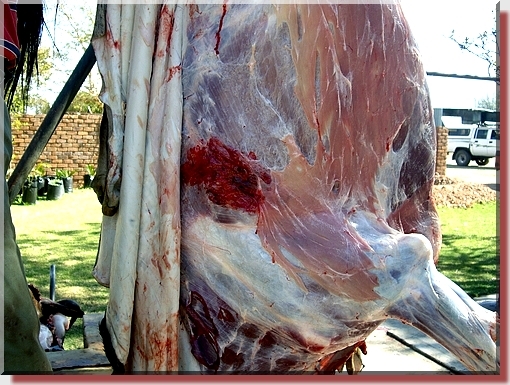 The bottom picture shows the exit wound with minimal meat damage. Theo says the owner of the game farm and fellow hunter were impressed with the results of his hunt. 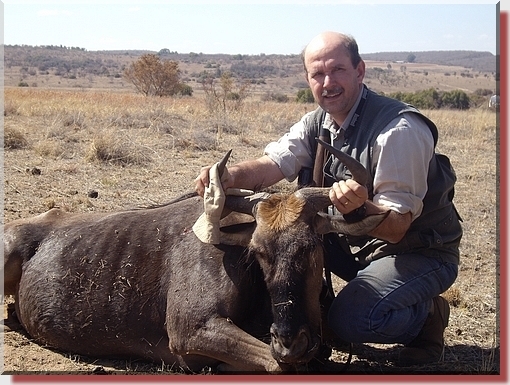 Theo shot another Blue Wildebeest with his .303, using the 140gr HV bullet at 2850gfps. (No pictures were provided, unfortunately.) He took a frontal chest shot at about 150m. It ran for 20m and fell down, dead. "These bullets are placing the .303 in a totally different class", Theo writes.